This has possibly been our busiest school year ever, or at least it’s felt like it. I think multiple factors have contributed to making it feel even crazier than usual. A major job and work schedule change for my hubby, a new church, and my youngest hitting school age and starting to participate in extracurriculars alongside his siblings, just to name a few. Regardless of why, I was unprepared, and our household and school routines have suffered. So, the opportunity to review Heidi St. John’s The Busy Homeschool Mom’s Guide to Daylight, published by Real Life Press, came along just when I needed some encouragement and inspiration to get things back on track. 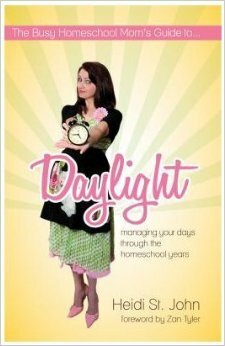 The Busy Homeschool Mom’s Guide to Daylight is subtitled “Managing Your Days Through the Homeschool Years”. Heidi, a busy homeschool mom of seven, writer, and speaker, aims to encourage both moms who feel overwhelmed by all that’s entailed in running a household and homeschooling, and those who just need some fresh inspiration. She covers not only the practical stuff like how to make a schedule, time management, tips for organizing your home, meal planning and preparation, etc., but also heart issues like being intentional, the importance of flexibility, procrastination, the tendency toward legalism, and more. In my case, it’s not so much that I don’t know most of those things, but that I needed the encouragement that it’s okay to scrap everything and start from scratch. I’ve had a system in place that’s worked well for years, but there comes a point when too much has changed and everything doesn’t just click along on autopilot anymore. I wasn’t proactive enough and let life take over more than I should have. And guess what? The things that worked well with my older two aren’t always a good fit for the younger ones, whether it’s a chore system, curriculum, or something else. Our days are much different now than they were then, and the same routines aren’t cutting it. Heidi’s gentle encouragement gave me the motivation I needed to take action and reminded me that flexibility is key! She writes about the ebb and flow of the homeschooling lifestyle. Life isn’t static, and we have to learn to successfully navigate the changing seasons and be realistic about what our schedules and routines should look like. Sometimes I forget that the ability to flex with the changing seasons is one of the beauties of homeschooling. I loved her concept of “white space”: keeping free space in your schedule, and planning to do nothing a couple of days a week. This allows for either spontaneity (not one of my strongest areas) or rest. The idea of free time is something I struggle with. I tend to not want to do it unless I’ve accomplished everything on my “to do” list. The problem is, I never get there! Being intentional about planning free time is something I really have to make an effort at. The Busy Homeschool Mom’s Guide to Daylight was a quick, encouraging read. I appreciate Heidi’s humor and her heart for homeschool families. This book is a good fit for a brand new homeschool mom who’s feeling a bit overwhelmed, or a seasoned one like me who needs to adapt to a new season, or is even just tired and maybe a bit burned out and in need of some inspiration. Click the graphic to read more reviews of this title, along with it’s companion, The Busy Homeschool Mom’s Guide to Romance, and several other titles from Real Life Press.